Spectacular quilting! Freehand quilting is so much fun, once you get your vision and let yourself go with it....at least in my opinion and that's how your quilting appears to me, like you really enjoy it. You really did make this quilt sing. Incredible!! You should be so proud, your quilting is outstanding. You did a REALLY nice job with this. I love the loft of the wool. I'm very close to trying my first quilt out with it. Hope it doesn't drag too much on my shoulder (no longarm here, so I have to do table-top). You did an incredible job with the open spaces and borders. So, so lovely! Wow that is a beautiful quilt Linda, the quilting really brings it to life. I don't know where you get your ideas from but - keep it up!! your quilting is amazing! did you use any rulers? Standing ovation! just love it--the feathers are drool worthy--and your creativity in the pieced blocks and plain areas is over the top. Beautiful work! The quilting is just amazing. The quilting makes the quilt sing. Love what you did with it. Wish I could see it in person! Stunning! You are a true artist. I bet Deb was in awe when she received it. How long did it take to quilt it? Wow!!! Linda your quilting really makes this quilt!!! Fabulous! Your quilting is so amazing! I really want to send one of my quilts to you to have quilted. Amazing! Absolutely beautiful! You've given me so many great ideas. You put your heart and soul into this quilt. This quilt is just GORGEOUS! I can't stop admiring it. I love the quilt and your quilting you did on it is just breathtaking. What a beauty and Deb must be thrilled beyond words. I don't know if I would want to touch it or just hang it up behind glass somewhere :D so that it can't be touched It's a real treasure for sure!!!! Beautiful! Truly outstanding! Incredible quilting! I look forward to the next reveal! Always trust your gut, especially with such a grand outcome!! Thanks for the pictures and letting us share in the eye candy. I want that quilt! It'stunning, you really put your heart into this quilt! Have a lovely and creative week! The quilting does this quilt so right! You did an amazing job! I can imagine Deb was very happy!!! That is... WOW. Excellent quilting. You're amazing!! And YES, you did a great job! Really pat yourself on the back for that one, lady! Beautiful job!! You are a great quilter!! Totally gorgeous! I can't believe you had doubts! WOW, amazing, gorgeous, stunning! I would have to say that you have a beautiful heart, seeing that you put your heart and soul into this quilt. Beautiful!! You transformed that quilt to WOW quilt! Good Job!! I have to say the balance and flow in your beautifully executed quilting designs makes this quilt come to life. And your 'whole nother level' made me laugh! (I love MAD TV). Wow your quilting really made this quilt. I could see how this quilt would be a little overwhelming trying to figure out how to quilt it. You did an amazing job. Thanks for all the pictures. I love all the different ways you quilted everything. Linda, The quilt is breath taking! 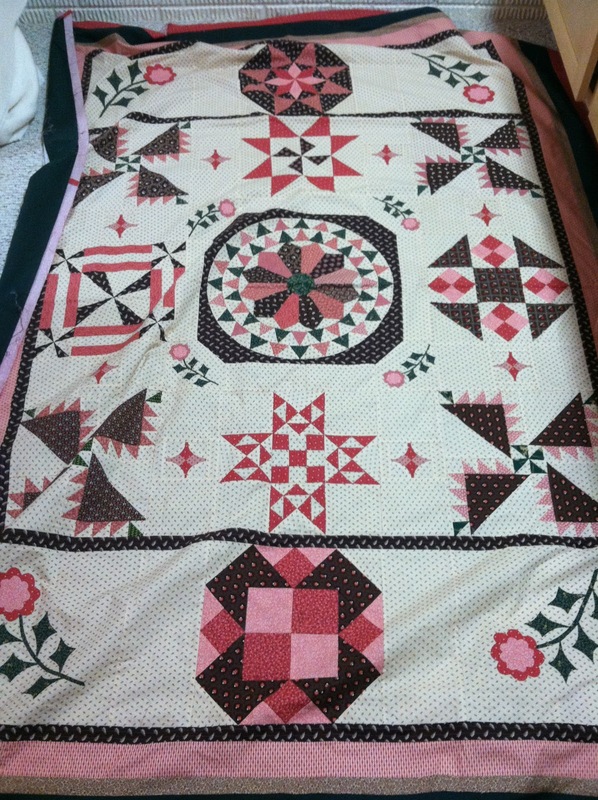 You have just made this quilt "pop" with the quilting! Hi! To all the commenters: I'm Deb, the lucky owner of this quilt. Linda did an awesome job on this quilt and her talent to highlight just the right parts of the quilt blocks and open spaces really makes this quilt sing. thanks again, Linda for quilting these for me. Be prepared - you might just get a few new customers because of these two quilts. Magnificent quilting on a fabulous quilt - well done to both of you! I love Deb's comment, you can tell she's over the moon about the quilting you've done for her and I don't blame her, you've got such a wonderful talent! What an amazing quilting job. The quilt is absolutely fabulous. Certainly proves that you are "a really good quilter." If I lived closer, I'd be taking all my quilts to you. Thanks for showing all those photos. A true masterpiece, Linda! Your talent continues to evolve so beautifully! I would be very, very proud of this quilt! Oh ... my ... it's beautiful! Your customer is right, it is amazing!! I would not know what to do, looking at that quilt. Seeing what you have done and all the beautiful quilting, it is gorgeous what you have done and the way you treated each area differently, it really bought the design into a new dimension. A little 'farm bird' told me I had to watch for this days blog; that the showcased quilt was to die for, and that I just couldn't get enough of it. That little bird was so right. Wonderful result Linda. You put your love for quilting into it. You and Deb owe me a laptop, I just drooled all over mine and it will never be the same. 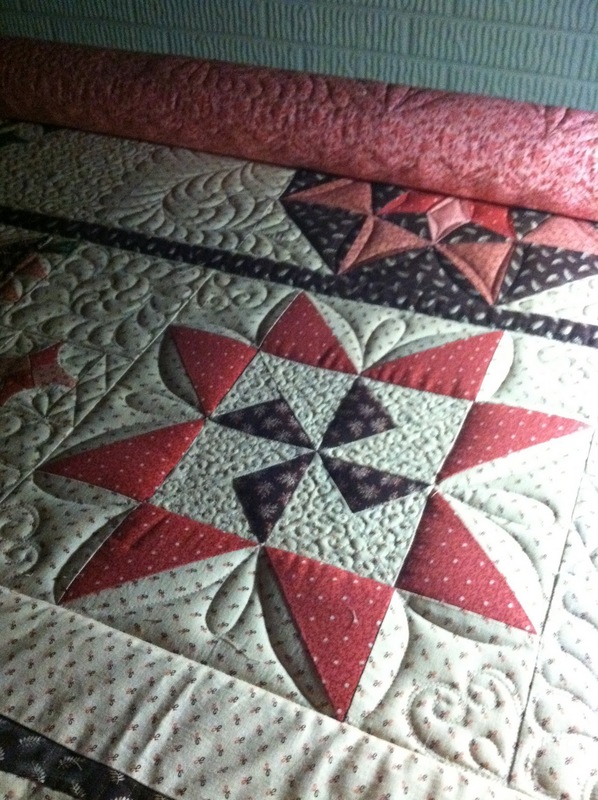 Deb always has fabulous quilts and it is good to see them quilted so beautifully. I'm oooing and aaaahhhing as well. Your quilting is so beautiful and I think it really makes the quilt! So many different designs....perfect! I just want to reach out and touch that quilt. Are there words that can even describe your quilting? You truly are an artist; this quilt is stunning. Just beautiful!! You should be pleased with your work, and the way it compliments the quilt. Yes, you did indeed do good. Thanks for sharing. Amazing! I would say you definitely qualify as a really good quilter. It's just amazing what happens with the quilting. It adds so much to the design and look of the quilt. You have outdone yourself again! Way to go! Absolutely stunning Linda. You filled those open spaces beautifully with a variety of motifs that gave the quilt a movement and balance. your quilting makes this quilt. Stunning. Gorgeous quilt - beautifully quilted. I was at the retreat with Deb, and got to oogle and fondle her two quilts. They are brilliant! You are an amazing quilter! Can't wait to see #3. All of your quilting is beautiful, but this one is simply amazing!!! Thank you for sharing the pictures. The quilting on this is just exceptional and so fun to really look at and enjoy. YOU are a true artist! I came across this quilt on MQResource. I had to come and see if you had more photos of it on your blog because your quilting is absolutely beautiful! 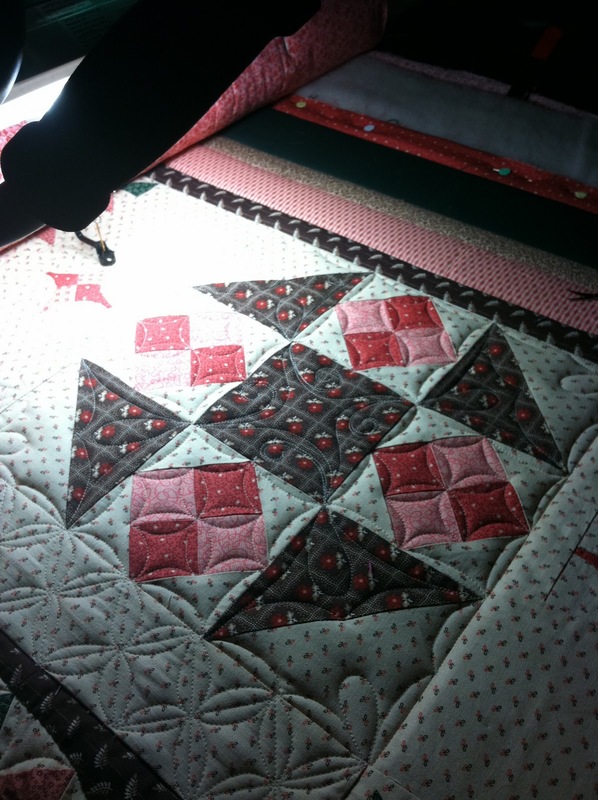 You have a real gift for quilting design and execution!